This QATR-301- The QATSPY EVERLAST Boxing Glove Golf Technique and mechanical advantage of syncing the golfer’s elbows with their shoulders is too huge of an advantage for the golfer not to develop in their golf game. 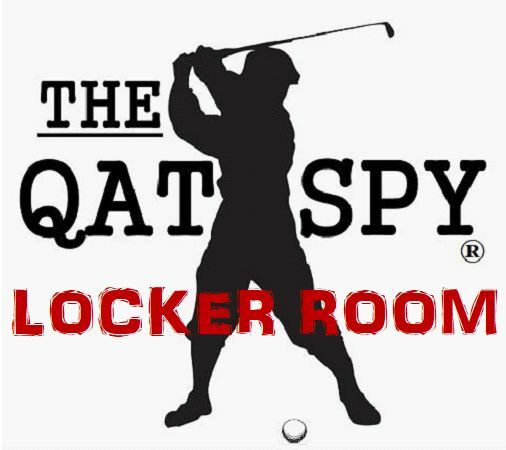 This technique is geared specifically for the golfer. No pun intended! The only thing the golfer has to do is to properly Sync/Preset their wrists together with their elbows. My grandfather, H.Q. 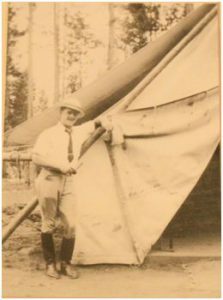 (QATSPY) Boatright, pictured here in a 1927 photograph in Yellowstone National Park, was anything but conventional in his approach to golf training techniques. You could say that he thought outside the normal coaching box and was ahead of his time. He was so far outside and ahead of his time that he had his students to swap out their golf glove for a pair of boxing gloves. 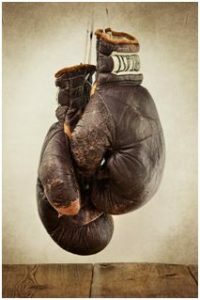 The boxing gloves helped the golfer identify and understand how to use their wrists, forearms, and elbows interacted with their shoulders in his coaching sessions. He believed that the elbows and shoulders should function similar to how sprockets on a ten-speed bicycle should function. The bicyclist synchronizes the sprockets on the ten-speed bicycle, where the small gear (elbow) turns the large gear for POWER (during the takeaway swing). Then at the top of the swing, the golfer synchronizes the gears where the large gear turns the small gear for speed (during the downswing through impact). The small gear is the golfer’s elbows, while the large gear is the golfer’s shoulders, as illustrated in the image above. 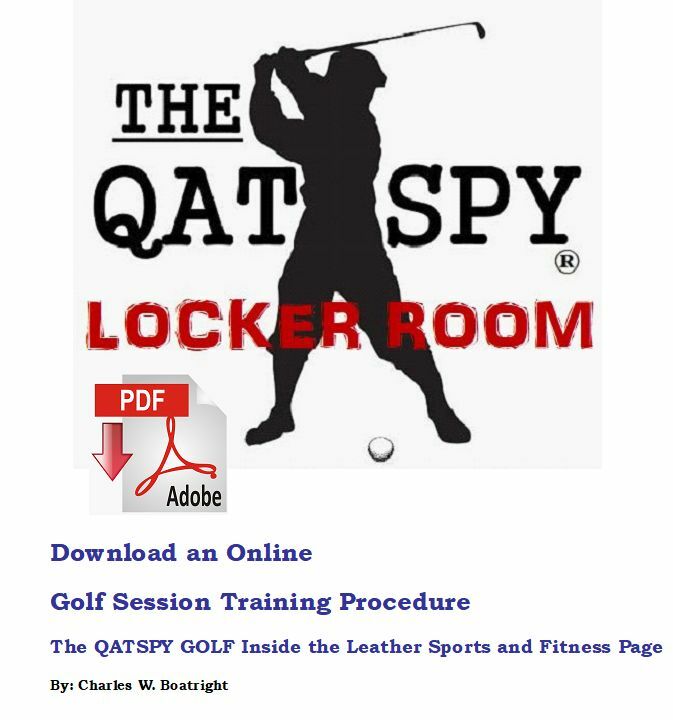 The golfer’s ability to understand and perform this technique not only provides a mechanical advantage to the golfer, but more importantly, a confidence in realizing they don’t have to swing hard. Even Yogi Berra realized this in one of his many Yogi-isms- You don’t have to swing hard to hit a home run. If you got the timing and technique, it’ll go. 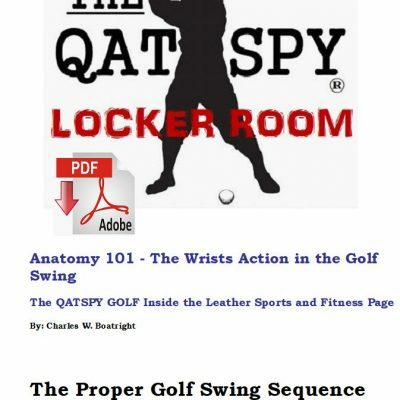 This technique and mechanical advantage of syncing the golfer’s elbows with their shoulders is too huge of an advantage for the golfer not to develop in their golf game. This technique is geared specifically for the golfer. No pun intended! The only thing the golfer has to do is to properly Sync/Preset their wrists together with their elbows. 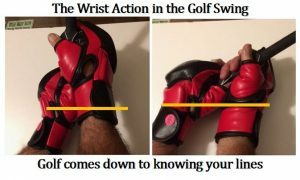 The boxing gloves do an excellent job of doing this by allowing the golfer to FIRST- identify their wrists and SECOND- see how the wrists are Synced/Preset into the Lock Position.